The impressive main prayer hall (musalla) is the highlight of the Sultan Qaboos Grand Mosque. Its external dimensions are 74.4m x 74.4m while the inner hall has an area of 4343 sqm and is covered by the the world's second largest hand-woven carpet with an area of 60m x 70m. 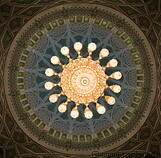 The chandelier above the praying hall is 14 meters tall. The entire prayer hall is beautifully decorated with Islamic patterns.